A Kings Tale: Final Fantasy XV is free on Xbox One and PlayStation 4. This will be amazing, but I'm not sure how likely I am to play this 100+ hour beast again. It's still my favorite Final Fantasy battle system. I always wanted to play that game. I wonder if it’s online. They are coming out on Xbox One as well. Noooo, don’t make me buy these two games again. I own both the PS3, PS4 and Vita versions of X/X-2 and the PS4 collectors edition of XII. But a Switch version sounds better than all of those. I know its a bargain for the best FF title. I was going to make a snarky comment on this, but upon further research I discovered that I clearly missed something here. When FFIX launched 3 years ago on mobile and next-gen platforms, it was $16. And I bought it at $16. However, apparently that was just a launch promotion, and a month or so after launch the price rose to its ‘standard’ price of $21. I just always assumed it stayed at $16 and they were just simply charging a Switch premium. But no, that’s the price everywhere. Which is insane when you consider you can buy the PSN Classic version for $10 or an actual physical copy of it for $15. 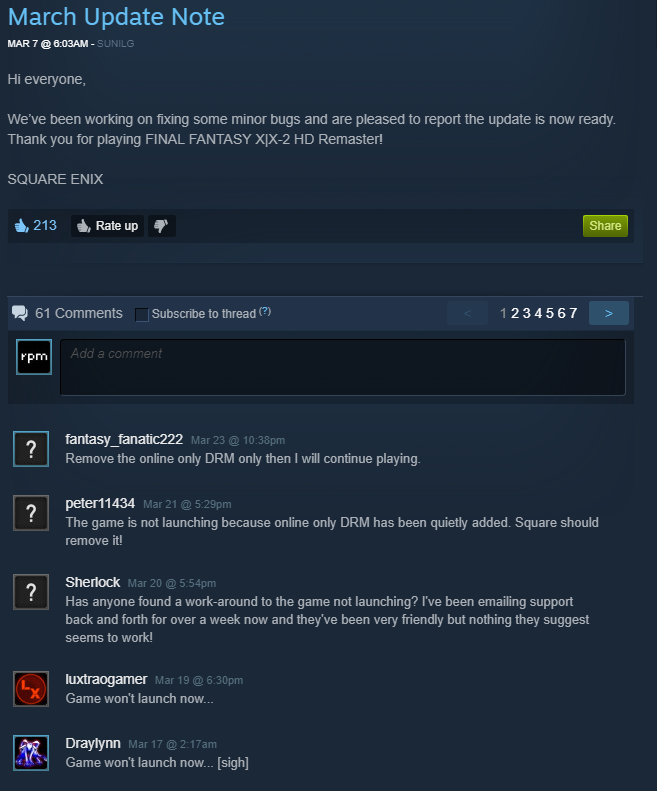 Square Enix have added always online DRM to Final Fantasy X/X-2 HD Remaster for Steam 3 years after it's release.